Hip-Hop and hoop culture have always been closely aligned. It’s a known fact that ballers want to be rappers and rappers want to be ballers. But, for the most part, each party lacks skill in the other field. There are a few exceptions to that rule, Iman Shumpert, Damian Lillard and of course, certified platinum artist, Shaq. But if we flip the coin on the conversation, who are the hiop-hop artists who can actually hoop? You’ll be surprised to find that there’s actually a lot. We’ve gone through and found nine of the best hip-hop ballers in the game today who put up some serious numbers on the blacktop. We’ve gotta kick off the list with the reigning NBA Celebrity All-Star MVP. This dude can seriously hoop, and his 2018 All-Star performance is testament to that. But back in his youth, he wasn’t known for his hooping ability. The Atlanta native was actually a star quarterback, leading the nation in pass yard led the county in passing yards and set game records for completions, even thought the team went 1-9 that year. Incredible. Jayceon Taylor aka ‘The Game” was a started for his hometown Compton High School where he averaged 14 points, 6 rebounds and 4 assists — according to him. While we can;t confirm these figures, it must have some truth behind it, with his high school hooping efforts enough to earn him a basketball scholarship to Washington State University. The Game’s time at WSU was cut short when he was expelled in the first semester for having been caught with drugs in his possession. With lines like “I got plans that are better than jail/Now look, we like Bird, Parish, Kevin McHale…” , Cam’ron clearly loves hoops. His love for the game started in his youth, where he used to dominate the Harlem courts. In high school, Cam played alongside fellow Harlem rapper Ma$e and claims that Georgetown University, University of Miami, Wyoming and USC all wanted him. But that all fell through when he dropped out of school during his senior season. He eventually earned his GED and received a basketball scholarship to Navarro Junior College in Texas. Probably one of the best ballers in Hip-Hop — even if he rarely flaunts it — 2 Chainz has some serious game. Long before his rise to stardom, Tauheed Epps was the star forward at College Park, Georgia’s North Clayton High School. The 6’5” rapper accepted a basketball scholarship to Alabama State University where he played off the bench for 35 games over three years. We’ve all seen Breezy ball out. 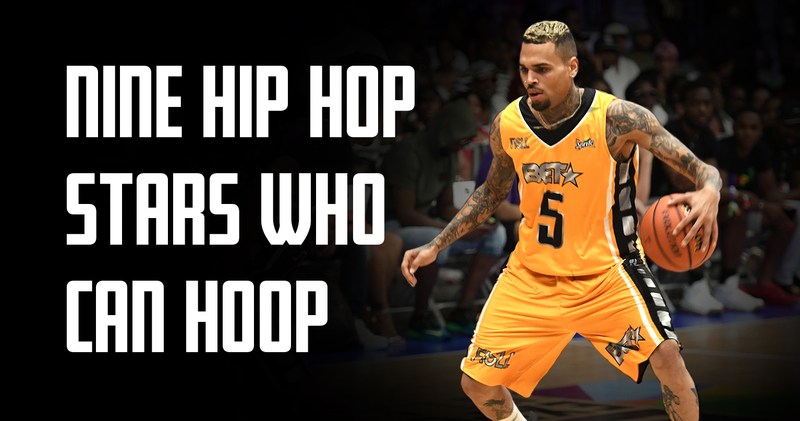 Chris Brown is definitely the most gifted athletically on the list — which is no surprise considering his dancing capabilities. The megastar has been known to train with leading NBA development coach Chris Brickley, and boy, have those sessions paid off. There’s really not much else to say when we can just show you his highlight reel below. Snoop is a huge sports fan, but basketball was his first love. it all started back in his high school days where he was was a member Long Beach Polytechnic High School’s basketball team. He had enough clout on the court to be scouted by several colleges. But don’t take our word for it, Watch his MVP highlights from the adidas Hip-Hop All-Star Game from earlier this year. At only 5’10”, Percy “Lil’ Romeo” Miller is little. So it’s surprising to see him on this list. He played well enough at the point to earn himself a scholarship to USC, despite only averaging just under 9 points a game.But, due to a shoulder injury, Romeo played just three games for the college. Just like Romeo, the Massillon, Ohio, rapper was a hooper before his record deal with MMG. He earned a basketball scholarship to Long Island University. but Stalley’s hoop dreams were cut short due to an injury. Luckily for him, his other dream of becoming a rapper came to fruition. Before Master P was captain of the tank, he was captain and point guard at New Orleans Warren Easton High School. The future founder of No Limit Records won a basketball scholarship to the University of Houston in 1987. Although P dropped out of college during his first semester at UH, he still made to the NBA — sort of. During the 1998-99 season he played with the Charlotte Hornets and in 1999, P played with the Toronto Raptors, but only during the preseason. The 6’4’’ swingman also hooped professionally in the CBA for Fort Wayne Fury and in 2004, P played with the ABA’s Las Vegas Rattlers. Oh, and he’s also Lil’ Romeo’s dad. Go figure.